As a farewell to my daily adventures in Round Rock, I've decided to do a roundup of all of the restaurants I frequented but never got around to writing about because I was too busy, you know, working. A chain restaurant with some healthy options. As a vegetarian I was a fan of the stir fry. You pick your protein (chicken, beef, tofu, shrimp or scallops) Then you choose a vegetable mix, a sauce, and your type of noodle (ramen lomein, flat chow fun, vermicelli or rice sticks) or rice (white brown or fried). All vegetarian items are clearly marked on the menu. The atmosphere is nice, teetering the line between hip and casual with bright red and blue interiors marked by track lighting. Maggie of Maggie's Austin is also a fan and has posted about it here. This place wins the "Most Annoying Website" award. Regardless, it is really a Round Rock staple. Pho is served piping hot and fast. Pho Hoang is always packed between 11:30 and 1, so get there at the beginning or the tail end of the rush if you don't want to wait for a table. If you don't mind waiting, I promise it won't be long. There aren't many vegetarian options but there are a few. 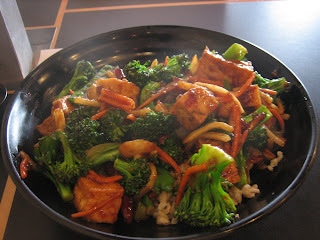 I would order either the vermicelli noodles with tofu and julianne vegetables or vegetable fried rice. The vermicelli nooodles threw me off the first time I ordered them because the julienne vegetable were seriously cold. Apparently that is intentional. Once I got over this the first time, I never saw it as a problem. My coworker Drew would always finish off a meal here with an ice coffee concoction that contained condensed milk. I tried it once and it was super fierce. The buzz I got from the caffeine was punctuated by the sugar rush. It took me a while to discover Rosie's Pho. Mostly because I already had a pho shop that served pho I couldn't eat (meat stock used) and I figured this place would be the same. A coworker convinced me to give it a try and found it actually to be completely awesome. 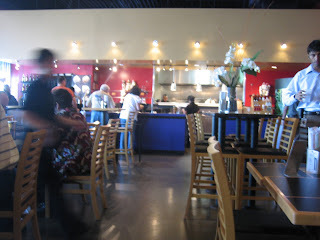 I was impressed by the extensive menu with many vegetarian choices and the quality of vegetables. The portions are large, so watch out, but at $7-$10 a meal, it really is a steal. The delivery of the food can be a little slow, but it is worth it. I found this place one day after a quick trip to AutoZone. I figured that I could snake my way back to I35 using a side road and on the way this place caught my eye. I forced my coworkers Joel and Brandi to accompany me there one afternoon and I was not sorry. Not only was the food delicious, but it was fun to watch Ethiopian food virgins struggle with the concept of Injera and eating with their hands. There is a lunchtime vegetarian buffet but patrons are also welcome to order from the menu. The owner, Woinee is from Ethiopia via Washington DC and she really knows her food. Just be careful if you are in a hurry at lunchtime, this meal could take a while. Woinee likes to chat with her customers and has some pretty interesting stories to tell. Also, do not turn down the gratis coffee at the end of the meal. It is absolutely amazing and strong. Boots in the Oven posted about Taste of Ethiopia here. Have a need to pick up some wine / liquor / gourmet specialty items? Grapevine Market has a really nice cafe in the back that is open for lunch. The last time I was there I had a grilled cheese and tomato sandwich with grapes for $4. They do mostly pizza, sandwiches and salads there and have a pretty good vegetarian selection. There's a patio outside that's nice for good weather, but you mainly just have a view of the parking lot. The hardest thing about this place is convincing coworkers that it is OK to go to a liquor store during their lunchbreak. mmmmm... Gumbo's. When someone else was paying the choice of restaurant defaulted either to North at the Domain or Gumbo's on 620, depending on time constraints. I can't say that there were a lot of vegetarian options at Gumbo's but they will gladly make you a very nice vegetable pasta and the salads are pretty rockstar. There is one thing I find really confusing about this place. Is it a chain? Or is Zorba's just an extremely common name for Greek Restaurants? I snapped this picture while I was in Amsterdam, and I swear it has the same color sceme and graphics of the one in Round Rock. Anyway, for about $8 you can get a vegetarian plate. You pick a soup or salad and then four sides. I usually ended up with lentil soup, hummus, spanokopita, eggplant and falafel patty. It turns out to be a whole lot of food. If you aren't that hungry, you can have a falafel with pita, lettuce, etc for $5 or $6. It is also nice to note that the place is BYOB. Cork fee is $3 for the first bottle and $1 for each bottle after that. That's all I have for now. Of course there are those establishments that have already been written about here. Did I miss your favorite? Let me know in the comments!